Built in 1860 by a congregation founded in 1811, the Aurora Presbyterian Church is a local landmark within a nationally registered historic district. 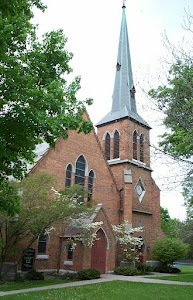 The Episcopal parish of Saint Paul’s, established in the village in 1835, joined with the Presbyterian congregation to form the United Ministry of Aurora in 1969. The church building, which is now home of the United Ministry has changed little in the past century. It was built under the supervision of Samuel D. Mandell on the site of an earlier Colonial style wooden church. The new brick church was designed by New York City architect Joseph C. Wells in Gothic Revival style. The bell tower and steeple were added in 1864. The clock was installed in 1865. The church interior underwent renovation in 1970 when a central pulpit was replaced with a divided chancel, but much of the sanctuary’s original character was preserved. The pews still bear the silver nameplates of early members who purchased seating. On the walls are found a brass Civil War memorial plaque and two marble portrait medallions by noted sculptor Erastus Dow Palmer. The circular stained glass window was imported from Munich. A custom designed 22-rank Moeller pipe organ was installed in the balcony in 1971. A bell peal was created in 1977. Three bells cast in 1922 were brought over from St. Paul’s to the Presbyterian bell tower, where they joined a single bell cast in 1851. These four bells from the two churches formed a perfectly tuned G major chord. South of the church is the Chapel addition of 1910, which contains a kitchen, classrooms, lounge and offices. The United Ministry makes these facilities available to the Aurora Preschool and other organizations. The stained glass window in the center of the east wall was brought over from St. Paul’s in the early 1970’s. The long windows on the east side were designed and installed by professional stained glass designer Margaret Kennedy (Wells 1952). To the north is the Memorial Chapel of the Nativity, given and furnished by generous members of the community in 1978. It is used for the children’s worship services and houses a three-quarter size antique Italian crèche, which is displayed during the Christmas season. On the lake side of the Memorial Chapel is the Memorial Garden, established in 2005. The garden features a labyrinth, a stone columbarium and an outdoor amphitheater in which summer services are held. Interment in the Memorial Garden is open to anyone.